Truepoint’s investment process is rigorously focused on the long term and rooted in a sound empirical foundation of decades of market performance data and the overwhelming evidence provided by many academic studies. Our approach is designed to build confidence, reduce complexity and mitigate both market and emotional risks. Start with Goals: Identify objectives; define time horizon, cash flow needs and risk preferences; assess financial resources required; evaluate savings ability and strategies. 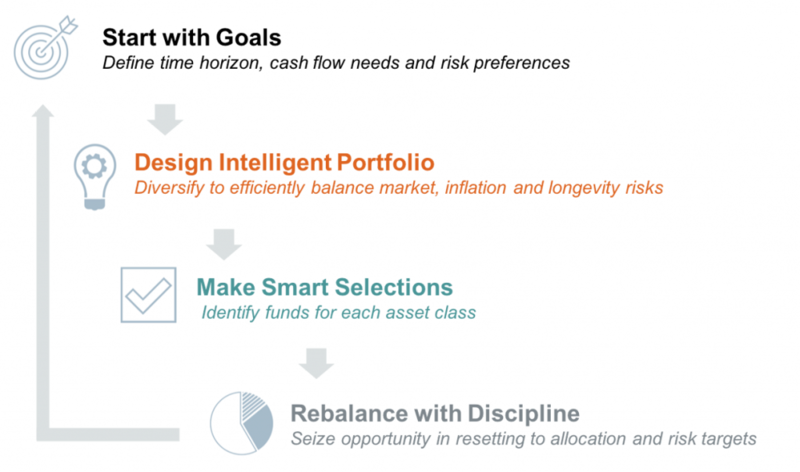 Design Intelligent Portfolio: Diversify by asset class to efficiently balance market, inflation and longevity risks in light of time horizon and cash flow needs; strategically allocate assets and classes so that overall portfolio volatility is lower than the sum of individual components. Make Smart Selections: Identify funds for each asset class; choose index funds based on design and total cost. Rebalance with Discipline: Seize opportunity in resetting to allocation targets; systematize “sell high, buy low” and maintain the intended portfolio risk levels.